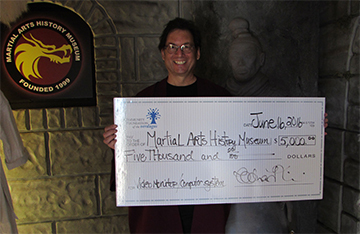 Burbank, CA – The Martial Arts History Museum is honored to receive a $5,000 financial grant from the Community Foundation of the Verdugos this month. Funds will be applied to replacing their display monitors as well as updating their entire computer editing system. The Martial Arts History Museum is a place for all ages to enjoy. Children and visitors have the opportunity to learn about artistry, music, culture and tradition and how Asian history became part of American history through the martial arts. In addition to tour groups, the museum creates special visitations for mentally and physically challenged children. They work with dementia and Alzheimer patients on a regular basis and they accommodate a number of associations including the Make a Wish Foundation. “The Community Foundation of the Verdugos has done a tremendous job in bringing each community together and we are so glad to be part of that effort. Our thanks to all those who made this grant possible,” concludes Matsuda. The Martial Arts History Museum is a non-profit 501(c)(3) organization and is completely dependent on grants, donations, visitations and memberships. Please consider making a donation today. For information, visit their website at Mamuseum.com or call (818) 478-1722.